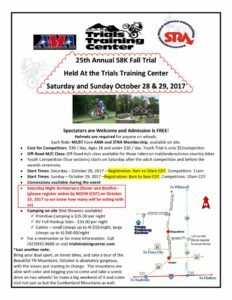 Just wanted to make sure everyone knows about Rounds 9&10 coming to TN and the Trials Training Center for our 20th Annual 58K! We still have two cabins, and some RV sites available so if you would like to get one please call for a reservation! Also, an idea has been mentioned…(thank you Harry) For those of you who have been to one of our Annual 58K’s , How about you wear your oldest 58K T-Shirt? We would love to see some of the old ones!! 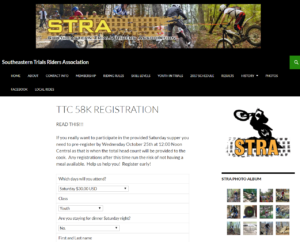 Saturday-October 27-Is Round 9 – Registration starts at 9am CENTRAL with competition beginning at 11am CENTRAL. 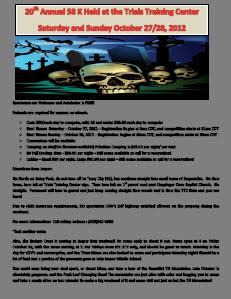 Sunday-October 28-Is Round 10 – Registration beginning at 9am CENTRAL with competition beginning at 10am CENTRAL. Also, the Enduro Cross is coming to Jasper that weekend! So come early to check it out. Gates open at 4 on Friday October 26, with the Races starting at 7. For Fridays races it’s UTV only, and should be great to watch. Saturday is the day for ATV’s and motorcycles, and the Trials Riders are also invited to come and participate Saturday night! Should be a lot of fun! And a portion of the proceeds goes to help Jasper Middle School. 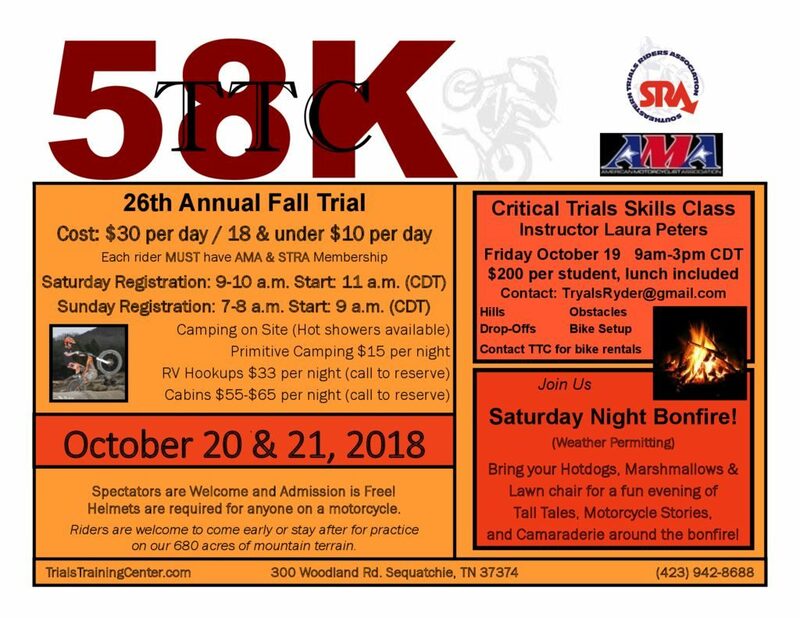 You could even bring your dual sport, or street bikes, and take a tour of the Beautiful TN Mountains. Late October is absolutely gorgeous, and the Peak Leaf Changing time! The mountains are just alive with color and begging you to come and take a scenic drive on two wheels! So make a big weekend of it and come visit not just us but the TN Mountains.